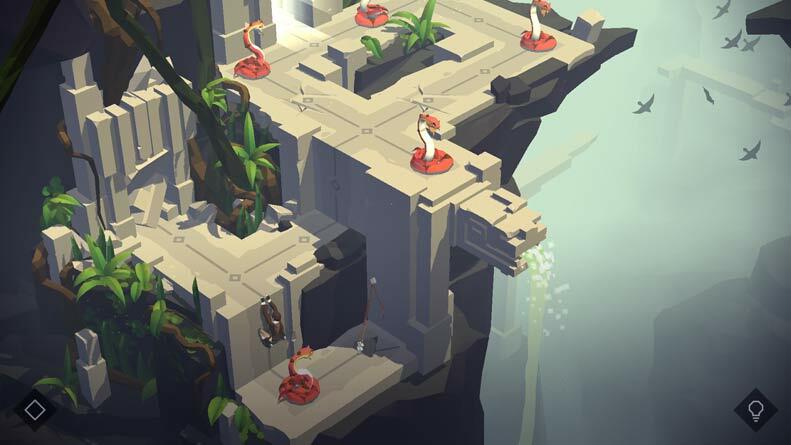 The name of this game, of course, is Lara Croft GO and it’s available for iOS and Android players. The GO after the name implies a trend that we hope they keep following: they take the basic premise of the game and twist it into something very simple and enjoyable for any player. Casuals and longtime fans can enjoy these types of game. With Hitman, players had to take Agent 52 through a series of stealth missions using intuitive play modes that allowed you to pass unnoticed each mission. With Lara Croft Go you will take the beloved Tomb Raider through a series of mazes and labyrinths where you will need to solve quite a few puzzles to keep advancing. It’s a simple game of logic and one that is wonderfully designed. The key difference with the past offering is that Lara has a lot more to do and stealth conditions do not limit her. She can explore each room with freedom and get the whole picture of what has to be done. Sometimes you will need to pick up an item and carry it out with you to place it somewhere else. You may also need to move around the things in your surroundings to get to the next stage. As we said previously: basic Tomb-Raiding skills. Lara Croft Go ask players to think logically before facing every room, it’s hard to die in the game, but you can still fall off a cliff or get damaged by spikes if you are not paying attention. Some of the rooms can get quite challenging, but the game can be completed in a sitting without guides or help of any kind. It offers casual gamers a chance at gratification, and experienced players can enjoy the new adventures of Lara in a simpler setting. The game has five stages and forty sub-levels that need to be solved. The main objective of each level is the same: to get Lara through the exit. Most of the obstacles found in your way are the usual lore offered in a Tomb Raider game: giant snakes, spike traps, saws, gigantic spiders. You will feel stalked by any of these elements or all of them at the same time in some rooms. Each movable item has a function, so make sure to activate to get an effect. The solutions to the puzzles found in Lara Croft GO will make lifelong fans remember the challenges posed by the original Tomb Raider games. Lara still gets to do a lot more than the things she did on their first adventures: she will need to avoid traps, or build bridges, luring enemies to place them as pressure pads will be very common as well. Every single move or turn you make takes Lara to a key spot; the elements of each room move around or change their stance. Sometimes you need to put everything back the way it was, other times you will have to figure out how to advance through the mess you have created. Make sure to pay attention. There are clues on what to do and how to do it at the beginning of every level. Some puzzles are time-sensitive, so quick thinking is needed. The more you advance, the more difficult the game gets. Lara will find objects such as spears and torches that will be needed further down the road, try not to lose them, or you will get stuck. The game has a very easy checkpoint system that can keep you advancing as quickly as you can figure out the solutions of each stage. The game is dynamic; it seriously doesn’t get boring at any point. Overall, this is an excellent offering from Square Enix. They keep delivering the goods while making some great games of popular properties for all audiences. The graphics on this game have a very stylish cartoon aesthetic that seems to combine the best elements of the first games with the smoothness of last-generation gaming. Make sure to try it out! It’s a great game, and it has a lot of replay value.